In many circles it is highly recommended—and in most universities, required—that student actors read the volumes of scripture-like pronouncements by Stanislavsky, Brecht, Vakhtangov, Grotowski, and other gods of the theatrical pantheon. David Mamet, Pulitzer Prize-winning playwright, and Academy Award-nominated screenwriter, labels these books as “impracticable theory . . . an impediment to both art and sustenance.” If this sounds sacrilegious, it is. The author himself points out that if theater were a religion, his book of essays would be considered heresy. Like the Polish theater director and theoretician Jerzy Grotowski, Mamet envisions a perfect theater experience as one in which fancy costumes, highly decorated sets, and intricate lighting are not needed. The essentials for Mamet are actors, playwrights, and audiences. Where Mamet diverges from Grotowski, Stanislavsky, and the American disciples in the temple of “method acting,” is in his aversion to the codification of actors’ training. Mamet considers the emotional explorations venerated in the various schools of The Method as feeble forms of psychoanalysis. Both method training and psychoanalysis, he points out, are time wasters for people who wish to avoid the matter at hand. In theater, the matter at hand is the play. 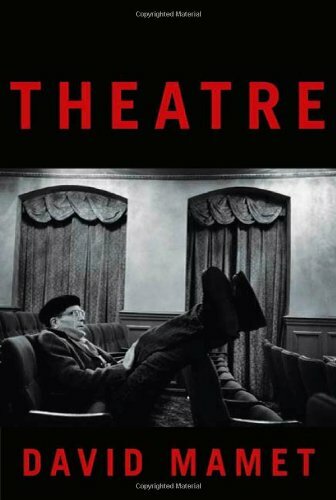 Mamet’s approach to acting is akin to that of Spencer Tracy, who is purported to have advised actors to, “learn your lines and don’t bump into the furniture.” The purpose of theater, according to Mamet, is to entertain the audience. Entertainment, in his definition, need not be frivolous or trivial, but audiences do not come to the theater to see someone else cry, or feel, or think. Nor do they come, he emphasizes, to be given lectures on the great political issues of the time. Mamet detests the exercises in which actors imagine the backgrounds, life experiences, and even the personal preferences of the character. The character, he says, does not exist. The character is only a cipher made up of the playwright’s words on the page. The insistence by Stanislavsky’s faithful followers on an actor’s knowing what the character ate for breakfast, where he or she went to school, and such, is just so much blather in Mamet’s vision of theater. He dismisses Sanford Meisner (his own teacher), Uta Hagen, Stella Adler, Herbert Berghof, and the others as perpetrators of a “psychoanalytic understanding of acting, which, like psychoanalysis, focuses the attention on the self.” Mamet suggests that the major thought lines of modern acting technique were developed in Russia during the Soviet era. Their rigidity, he says, is akin to the repressive, controlled arts processes allowed and supported under that regime. Rehearsals, in the psychoanalytical theater mode, resemble the confession sessions prevalent in Communist Party circles. Actors spend days talking about themselves and the character rather than preparing the play for presentation. However, Mamet doesn’t shun all rules. He espouses a handful of guidelines aimed at making the play accessible to the audience. He champions practicality. His aim is to present a theatrical experience that will put “asses in the seats.” Mamet decries state sponsored and grant supported theater and demands an art form that sustains itself by selling tickets to an enthusiastic audience. He tells actors to position themselves in a way that they are speaking toward the audience and not to the back wall, not move on a laugh line, never to walk during another actor’s lines, and not to look at the floor. His most practical advice comes as a quote from the late George Burns: “Always take your wallet onstage with you.” If Mamet is harsh on modern schools of acting, he is scathing when it comes to directors. Directors are to be done away with entirely. Plays, he declares, need playwrights and actors. Directors are like the immigrant who stood at the ship’s rail and pushed downward every time the ship sailed down the crest of a wave. After a few days of this, the man actually thought his pressure on the rail was controlling the motion of the vessel. In Mamet’s view, directors hinder rather than help plays in their progress toward the true goal of performance. Theatre by David Mamet is not the empty screed of a theorizing dilettante. It is the distillation of five decades of significant theater experience. The result is a magnificent and thought-provoking book. It’s a book that (and one can imagine the author wincing at the irony) should be required reading for both beginning and experienced actors. Reviewer Martin A. David is an author and actor who has studied at the Herbert Berghof Studio in New York, as well as with disciples of Grotowski and Stanislavsky. He also has taught acting and directed plays.